Carrie and friends dreamed up the Money Bead Birthday Necklace for a certain someone here at Pink Chalk who just turned 50. 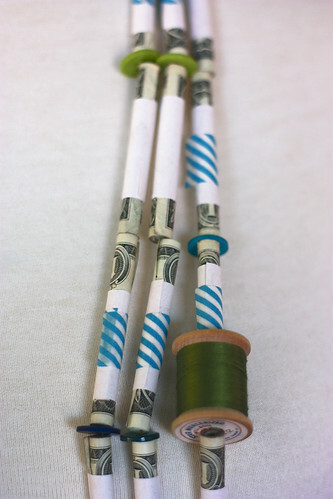 Each bead is a rolled dollar bill, wrapped with paper then taped to secure each bill. 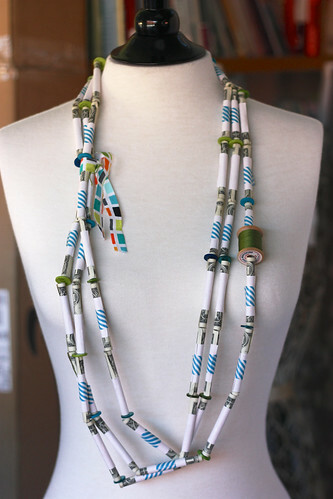 Carrie added washi tape, for color, to a handful of beads. The beads are strung using pearl cotton thread and button accents. 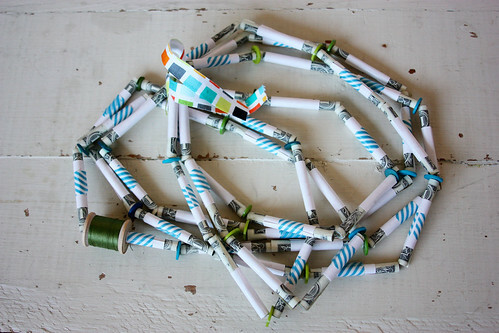 Love the spool of thread thrown in as a focal point! The necklace is looped around 3 times and tied with a piece of salvage. What a lucky girl to receive such a special gift on such a big day! Also a festive gift for a wedding, graduation, baby shower… Mother’s Day? Oh that’s cute! What a great idea! It is almost too cute to take apart and spend the money! I love the washi tape and other accents. I have to ask, are there 50 dollar bills? I am making one for my girlfriends 40th birthday party tomorrow. Funny thing is….we up here in Canada have done away with our one dollar bill and it is a coin now. As is our $2 bill now a coin. So I had to use $5 bills. (good thing it is a gift from “the group”) I’ll post a picture after the party. It was fun to make ! oh and Happy Birthday to that certain someone !